Fremont, CA – November 16, 2017 — CORSAIR®, a world leader in enthusiast memory, high-performance gaming hardware and PC components and today announced the launch of the new ML PRO RGB range of PC cooling fans. Building on the success of CORSAIR ML Series fans, which are equipped with magnetic levitation bearings to deliver almost frictionless operation, CORSAIR ML PRO RGB fans add four individually controlled RGB LEDs on the fan’s center hub, creating a vivid 360° blast of light and color. Enhanced by frosted fan blades and customizable with near-limitless options in CORSAIR LINK software, ML PRO RGB fans create a bright circle of custom-color-lighting that makes any PC standout from the crowd. Behind the lighting, ML PRO RGB fans retain the quality and performance that’s made ML Series fans a staple of high-end PCs and the most ambitious builds, with a magnetic levitation fan bearing that physically levitates the fan rotor to almost entirely eliminate bearing friction. The custom-designed fan rotor delivers the perfect balance between high static pressure and high airflow, while a low-noise tuned PWM control range means that, even at full speed, ML PRO RGB fans are incredibly quiet. Available in 120mm or 140mm sizes, ML PRO RGB fans are sold in three fan (120mm) or two fan (140mm) kits. Each kit includes both a CORSAIR RGB Fan LED Hub and Lighting Node PRO, unlocking in-depth software control using CORSAIR LINK for up to six fans. Tie ML PRO RGB fan lighting to CPU or GPU temperatures for an at-a-glance update on your PC’s performance, or choose from a wide selection of patterns and effects that flow from fan to fan in a dazzling light show. 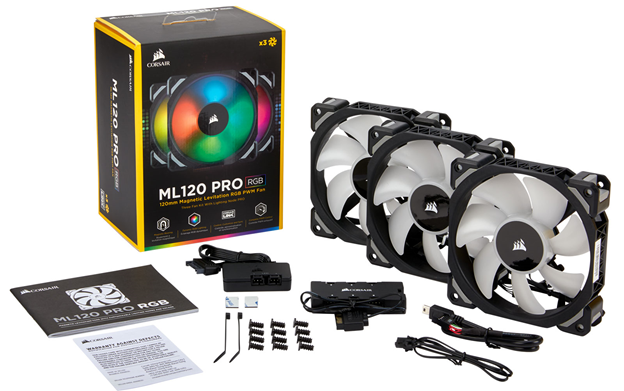 ML120 PRO RGB and ML140 PRO RGB fans are also available individually as an expansion to existing kits. Combining the very best in enthusiast PC fan performance and design with vibrant RGB lighting, ML PRO RGB fans deliver quiet cooling, in any color. CORSAIR ML PRO RGB fans are available immediately from the CORSAIR worldwide network of authorized retailers and distributors as well as direct from the www.corsair.com webstore. CORSAIR ML PRO RGB fans are backed by a comprehensive five-year warranty and are available immediately from the CORSAIR worldwide network of authorized retailers. 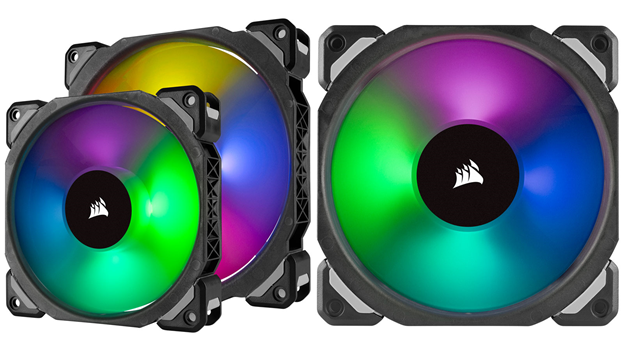 CORSAIR ML PRO RGB are available in both 120mm and 140mm sizes. Please refer to the below grid for a full product specification breakdown. For up-to-date pricing of the CORSAIR ML PRO RGB fans, please refer to the CORSAIR website or contact your local CORSAIR sales or PR representative.